Dierks Bentley and The Band Perry will headline the ACM Party for a Cause Festival, a two-day outdoor music event which is part of the ACM Experience this weekend in Las Vegas. The concerts for charity will take place in the East Parking Lot of the Orleans Arena. Scheduled to appear on Fri., April 5 are The Band Perry, Greg Bates, Brantley Gilbert, Justin Moore, Cassadee Pope and Florida Georgia Line. Scheduled for Sat., April 6 are Dierks Bentley, Lee Brice, Kix Brooks, Hunter Hayes, Dustin Lynch, Eli Young Band and Love and Theft. The festival runs 3 p.m. to 9 p.m. on Friday, and 12 p.m. to 9 p.m. on Saturday. The ACM Experience is a free open-to-the-public country music lifestyle event going on April 5-7 at The Orleans Hotel and Casino in Las Vegas. The events will culminate in the 3rd Annual ACM Fan Jam headlined by Brad Paisley on Sun., April 7. 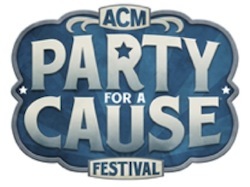 Separate tickets must be purchased for admission to Party for a Cause and ACM Fan Jam. At the Party for a Cause, Friday’s line-up will be sponsored by Outnumber Hunger, an initiative from General Mills, Big Machine Label Group and Feeding America. Saturday will be hosted by Kix Brooks and will include a presentation of charitable donations to the military-inspired non-profit organizations Wounded Warrior Project®, Folds of Honor and Nellis Air Force Base Force Support Squadron. Tickets and details available at www.theacmexperience.com.